It’s winter in the states right now! And that means for many of us… DRY, CRACKED SKIN. Well, I have the antidote. And that is this recipe right here! I adore this herbal combination! It is healing, soothing, anti-inflammatory, and smells like floral heaven! Calendula is a super flower. It is most often used to treat scrapes, burns, minor cuts, rashes and bug bites. Lavender oil is great to combat acne, soothe dry skin, and reduce redness. This salve is SO simple to make. The only bummer is that you have to wait 2-3 weeks in order for the oils to infused. But patience little butterfly! It is so worth it. Fill one of the mason jars half way with dried lavender. Fill another 1/2 way with dried calendula flowers/petals. Fill the jars with sweet almond oil- ensuring the herbs/flowers are covered completely by at least 1 inch. Cap the jar and shake well! Shake the herbs at least once a day. At this time, also inspect them and ensure no herbs are traveling above the surface. If they do emerge, they will grow mold and your oil will ruin! After 2-3 weeks, strain through a mesh strainer. Part 2: Make the salve! Pour 1/2 cup Infused lavender oil and 1/2 cup infused calendula oil in the double boiler. Add 1 ounce beeswax and stir until the beeswax has complete dissolved. Carefully pour hot salve into clean jar and cool completely before use. 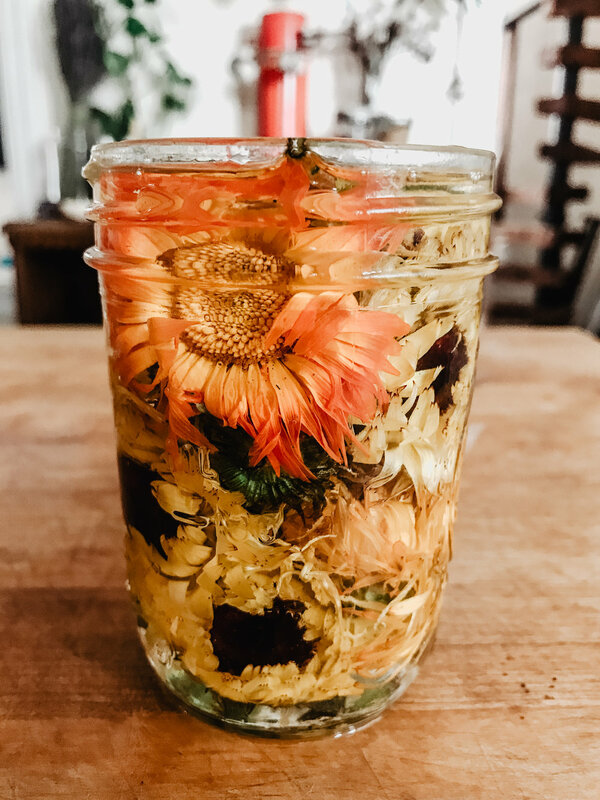 I infused this oil with fresh flowers- but I HIGHLY recommend using dry instead. Fresh goes rancid easily. I have an obsession with bringing the outdoors into my home- I think many of you feel the same way. Whether you actually burn these bundles or not, they are beautiful items to have around the home or to gift to others. My most favorite part of these bundles particularly is that I used bits of evergreen that was going dry. As well as "woody" herbs from my garden. 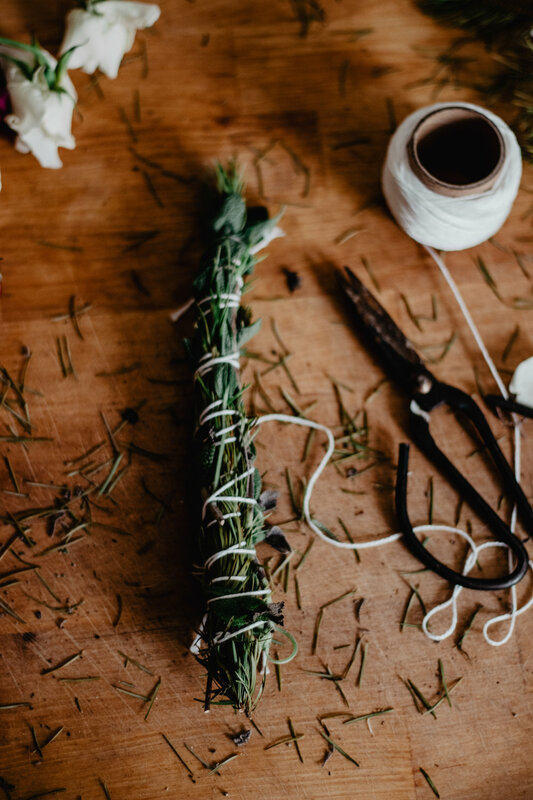 Traditionally, burning bundles are made by tightly binding dried woody, resinous herbs that slowly burn. This is a beautiful way to put to use the herbs from your garden! And if you don’t have an herb garden yet, this is good motivation to create one! Great herbs to use are white sage, cedar, sagebrush, mugwort, thyme, lavender, juniper, pine, rosemary, lemon balm, mint, and more! I personally used pieces of fraser fir from a Christmas tree, as well as sage, rosemary and lavender from my garden. I also used rose buds that were dying and about to be thrown out. *Note* : Common garden sage is not a safe herb to burn and therefore, I will not burn the bundle that contains is and will use it for aesthetic purposes only. :) If you plan on burning sage, you will need to purchase or grow white sage. An array of “woody” herbs of your choice. You don’t want to “pre dry” your herbs or flowers- this will make binding tightly more difficult. Follow the following photos. Essentially, you will tightly bind layers of herbs on top of each other. Place bundles in a dry area and wait for them to dry completely before burning. Better yet, string them up upside, down.